← How To Follow Me On Twitter!! What is a Launcher? I hear this all the time. What do you mean you can change it? Why would I want to do that anyway? These are good questions. 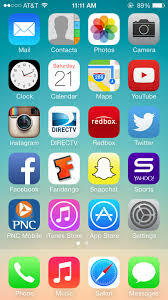 In a market dominated by the iPhone, most people don’t even realize they are using a Launcher. You are. It’s that grid of apps and folders on your iPhone screen. That’s your launcher. It’s how you interact with the device. And on an iPhone it can’t be changed. And that’s okay. It’s a good interface, and it’s certainly easy to use. So no worries all you iPhone users. I’m even an iPhone user from time to time, and I don’t mind the Launcher. It’s the same Launcher on my iPad Mini. So don’t get hot under the collar when I tell you that Android is different. With Android phones your Launcher can change, and it’s pretty cool when it does. These are launcher screens. In order, they are HTC One (M8), iPhone 5S, and the Samsung Galaxy S5. All similar but different in their approach. Every single Smartphone has a stock launcher. HTC has Sense. Motorola has BLUR. Samsung has TouchWIZ. When you first turn on your Android phone, you will be staring at one of those Launchers, masquerading as your phone’s “operating system”. 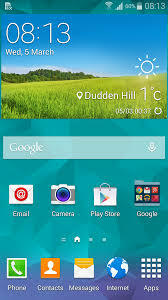 I currently use an HTC ONE (M8), and for the first couple months I used the stock Launcher, “Sense 6”. It’s a slick interface, but it looks a lot like every other launcher, including iPhone’s design. 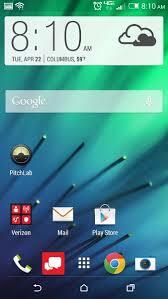 Both Apple and Android launchers have the ability to move apps around, and add folders. What makes Android different is you manipulate the screen in different ways. You can place apps in specific locations (not tied to the grid pattern), you can add widgets (that’s how Android phones have that big clock on the screen), you can even leave the screen blank (for the minimalist crowd). Android offers so many choices. Just open your Widget menu and feel your eyes glaze over at all the options. For the casual tech user there are simply too many, I would argue. So I set out to find a better Launcher. My goal was simple. I was going to find Launchers that did everything for me. I don’t want to build my own folders. If it’s a game, put it in a folder called “games”. But I wanted to go even further. I wanted the device to figure out which apps I wanted and make them available. I wanted the phone to look different based on where I was and what I was doing. I didn’t want to have to do any work. What a quest! Impossible you’d think. But after testing out over ten launchers I settled on two. They are Everything Me and Aviate. While I’ve used both launchers consistently, for the sake of your time, I’m going to focus on my favorite, Everything Me. Perhaps Aviate will get its own moment in the spotlight down the road, as it’s a very close runner up. So let’s talk about “Everything Me”. I’ve been using Everything Me for a couple of weeks now. This Launcher is what you’d call “smart”. That means it uses a variety of source data to customize your experience with your smartphone. Replacing the stock launcher with this smart launcher is a simple process, and after you’ve entered a few pieces of information (location data for the most part) you are up and running. You’ll notice right away that the interface looks very similar but also very different. The grid of folders is still there, but it’s automatically grouped. There’s also a spot called “FIND”. And it’s there that Everything Me first shows why it’s such an amazing Launcher. The find button is truly what makes Everything Me unique. It gives you the option to either type or speak to search. When you search, the phone will bring back results both from your phone (installed apps, contacts, calendar, etc) AND from the Internet. That’s right, it basically does a google search for everything you are looking for. The best demonstration I’ve found for this is a new album from my friend’s band “Put Down the Muffin“. I have the CD saved on my phone. When I search for “Put Down the Muffin” my phone brings back internal results, including a button to direct me right to the album within the Google Music app that I use to listen to my music on my device. But it also gives me Internet Links (by way of app icons) which send me to, say, the bands Facebook page! It’s remarkable, and combines several searches into one. When I say the folders offered by Everything Me are smart, I mean really smart. The folders are generated automatically when you set up the Launcher. Games go in “games”, music apps go in “music”. Other smart folders on my device include, “news”, “shopping”, “health and fitness” and even “I’m Bored”. You can add and remove smart folders, you can move them around the screens, and you can customize them if you choose, though you probably won’t need to. But the creation of the folders is only the tip of the iceberg. When you click on a smart folder everything changes. The wallpaper picture changes to something related to the category. The “social” folder shows a bunch of people’s faces in a huddle, the finance folder has a calculator, the photos folder has a camera lens, all serving as the background picture. The apps you have installed appear at the top (as the buttons you are used to), but just like the search function, the smart folder contains web search information for that category as well, appearing as additional apps. So when I click on “shopping” I see the apps I have installed “Google Play, Amazon, Target” but I also get links to web pages for other stores as well that I might consider. It’s a fast way to see more than you’re initially looking for, but perhaps exactly what you want to see! Everything Me is the best example I’ve found of a Smart Launcher. While so much is done for you, there is still the option to add your apps as icons, to add widgets, and personal wallpapers. The interface is still a grid of icons and folders, so the look isn’t too foreign to someone used to a stock launcher. But with Everything Me, I rarely go past the “Find” button, because if I want to do anything from make a phone call, listen to a song, search the web, or play a game, all I need to do is tell the phone what I want to do, and it takes care of the rest. It is truly a SMART option, for us lazy people who don’t want to type stuff, or have a logical organization system for our many applications. So give it a try, because the best part is that this application is free and ready for you to experience. Posted on August 12, 2014, in Reviews and tagged Android, launcher, review. Bookmark the permalink. Leave a comment.